Gen. Bipin Rawat, chief of the Indian army, announced last Thursday that the military is launching war games next month to test "structures geared towards sudden and swift offensives into enemy territory by ‘integrated battle groups,' or IBGs, reported Ajai Shukla, an Indian journalist and former army colonel. These new structures will be "validated" in military exercises on the ground in May. a shallow thrust offensive into Pakistan to capture territory "that can be used in post-conflict negotiations to extract concessions from Islamabad." This offensive ingress is to be executed using a small number of division sized ‘integrated battle groups‘ [emphasis added] within three to four days of political clearance and mobilization orders. Furthermore, proponents argue, the limited aim of capturing a small sliver of Pakistani territory—in contrast to bisecting that country—will guarantee that Pakistan's nuclear redlines are not crossed. 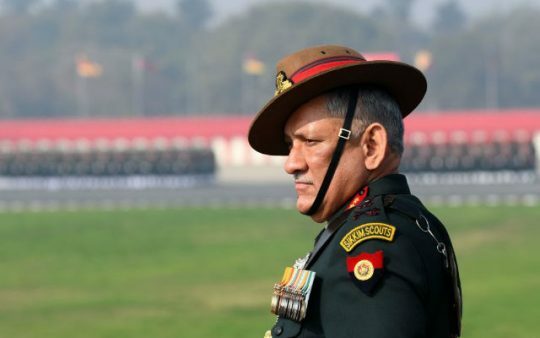 "Hopefully, after [exercises in May], we will go to the government and take their sanction [to restructure traditional divisions into permanent IBGs]," Rawat said last week. For years, analysts have debated whether Cold Start is a functional, officially endorsed strategy within India; the Indian political and military establishments have not officially sanctioned the doctrine. In January 2017, however, Rawat appeared to acknowledge the existence of Cold Start. "The Cold Start doctrine exists for conventional military operations," Rawat said. "Whether we have to conduct conventional operations for such strikes is a decision well-thought through, involving the government and the Cabinet Committee on Security." It was the first time that an actively serving Indian official acknowledged the doctrine's existence. Rawat's more recent comments seem to solidify further that Cold Start is very real, even if it has not yet been fully implemented. It is easy to see how a large-scale terrorist attack on Indian soil tied to Pakistan, whose military and intelligence services have links to countless jihadist groups, could trigger Cold Start, which in turn could trigger Pakistan using a nuclear weapon. From there, who knows what would happen? Would it even be possible to control escalation? Perhaps this is all an overreaction to one Indian general's comments. But there is growing evidence that Cold Start is real and may be operational soon enough. In 2000, Bill Clinton called the Indian subcontinent the "most dangerous place in the world." That statement remains true today. Even though India and Pakistan may not get all the headlines in the New York Times, they better be on the Trump administration's radar. This entry was posted in National Security and tagged India, Nuclear Weapons, Pakistan. Bookmark the permalink.